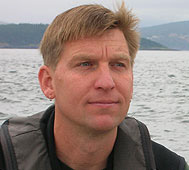 Dr. Jude Apple is a Marine Scientist at the Shannon Point Marine Center of Western Washington University. One half of his position is in conjunction with COSEE Pacific Partnerships. 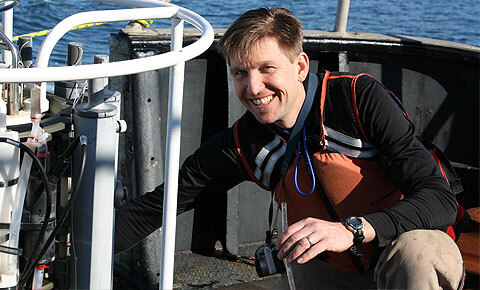 His research focuses on the ecology of aquatic microbes, and specifically on factors shaping their metabolic processes, phylogenetic composition, role in microbial food web dynamics, and contribution to ecosystem-scale biogeochemical processes. His unique position – half researcher, half outreacher – may be unusual today, but Jude sees it as the wave of the future, and where the next generation of grad students see themselves going. (He himself had a double undergraduate major in both science and education at Tufts, and received a teaching certificate in secondary school science.) Being a "soft money scientist" means he is entirely responsible for his salary being raised through grants – which, while potentially stressful, also allows Jude to pursue the research areas he is most interested in, and in conjunction with outreach. The result is that Jude's projects all contain the twin pillars of hands-on research and education. "Sometimes I pursue a research project because I know it will also make great education and outreach." Jude's research provides platforms for students to do own their own independent, hypothesis-driven projects, which may then lead to the development of new outreach. "Sometime it works the other way," says Jude, "when research and publications come out of outreach efforts." In his experience, this is often a chicken-and-egg situation, with both research and outreach being driven by the other. And this willingness on Jude's part to remain open, to take risk and initiative, to make things happen, is why people are inclined to call him an entrepreneur. Photographs and images for Jude's pages courtesy of Jude Apple, COSEE Pacific Partnerships, and Shannon Point Marine Center.